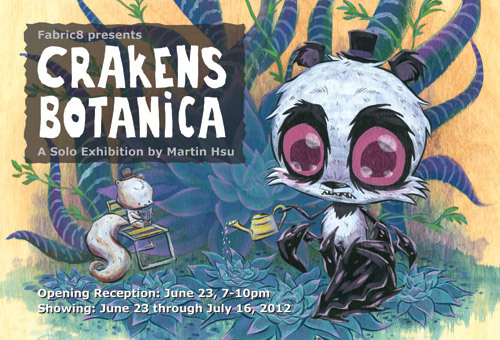 fabric8 presents Crakens Botanica, a solo show featuring new works by San Francisco artist Martin Hsu. With this exhibition, Hsu renders the world of the Crakens, a group of grotesquely adorable hybrid misfits who love nature and all living organisms. Half-land animal and half-sea creature, CRAKENS are the ultimate winners in evolution. While naive and gentle beasts who enjoy gallivanting with their woodland friends, they also start thrashing at the sight of nuclear power plants or illegal logging. Crakens Botanica will explore the similarities between Crakens and succulent plants, which are both sharp and pointy on the outside but soft and squishy on the inside; also both hardy and enduring yet intriguingly beautiful to the willing. San Francisco-based artist Martin Hsu finds inspiration in nature and the animal kingdom. Having worked professionally as a character designer in animation, he currently invests his time and energy in developing fun and original characters of his own. His beloved Crakens are guardians of our precious environment, and he hopes people appreciate the message and enjoy the humor. Crakens Botanica was on exhibit from June 23 through July 16, at fabric8, 3318 22nd Street near Valencia, San Francisco.